Learn the basics of wiring a children’s picture book from publishing professionals! Presented by members of the Society of Children’s Book Writers and Illustrators. 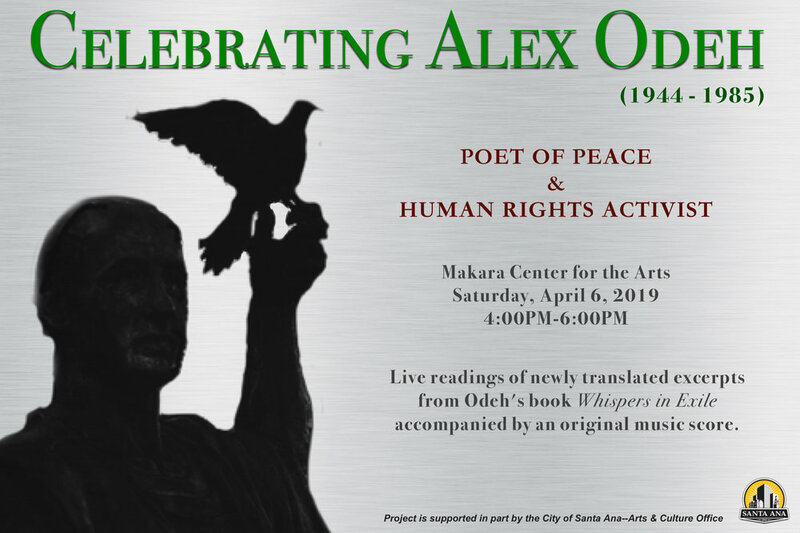 “Celebrating Alex Odeh” on Saturday, April 6, 2019, will mark what would have been the 75th birthday of poet, activist, and Santa Ana resident Alex Odeh; as well as the 25th Anniversary of the statue dedicated in his honor at the Santa Ana Public Library. Odeh’s story remains untold to many city residents, and this event intends to promote awareness of his work as a poet and human rights activist. The performance will feature newly translated readings of Odeh’s book “Whispers in Exile” in English, Spanish and Arabic, set to an original music score. Project is supported in part by the City of Santa Ana - Arts & Culture Office. Greg Camphire is an artist/musician and recipient of the 2018 Santa Ana Artist Grant. His multimedia project, Spooky Action Labs, combines percussion with computer software and synthesizers to create original compositions and improvisations. As a mobile, modular workspace for stage and studio environments, Spooky Action Labs invites listeners into an overall imaginative experience. MIDI Sprout is a new form of technology that uses sensors to capture biodata from plant life, converting electromagnetic currents into musical sounds. This device will be applied to an olive tree—a universal symbol of peace and a specific symbol of Alex Odeh’s Palestinian homeland—to create a new musical backing for those who recite Odeh's words at this special event.